Acknowledged author Douglas Kenrick wrote Social Psychology: Goals in Interaction (6th Edition) comprising 608 pages back in 2014. Textbook and etextbook are published under ISBN 0133810186 and 9780133810189. Since then Social Psychology: Goals in Interaction (6th Edition) textbook received total rating of 4 stars and was available to sell back to BooksRun online for the top buyback price of $75.85 or rent at the marketplace. Reveals social behavior motives, and bridges the person and the social situation. A unique integrated approach to social behavior, Social Psychology, 6/e invite readers to consider the interplay of influences inside and outside the person in social situations. 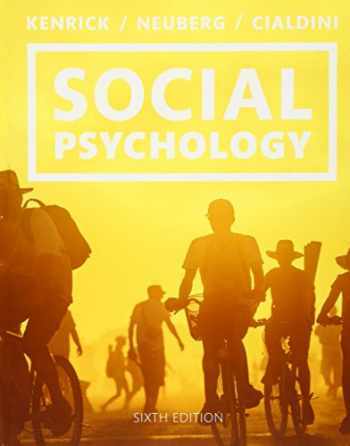 The authors emphasizes how social psychology is an important discipline, connecting different areas of psychology (e.g., clinical, organizational, and neuroscience) as well as other behavioral sciences (e.g., anthropology, biology, economics, medicine, and law). Organized around the two broad questions -“What purposes does this behavior serve for an individual?” and “Which factors lead an individual to use this behavior to achieve those goals?” - each chapter considers factors in the person, in the situation, and in their interaction, to form an understanding of human behavior. REVEL from Pearson is an immersive learning experience designed for the way today’s student read, think, and learn. REVEL modernizes familiar and respected course content with dynamic media interactives and assessments, and empowers educators to increase engagement in the course, better connecting with students. The result is increased student engagement and improved learning. REVEL for Kenrick Social Psychology, 6/e will be available for Fall 2014 classes. Teaching and Learning Experience This program will provide a better teaching and learning experience- for you and your students. It: Immersive Learning Experiences with REVEL: REVEL delivers immersive learning experiences designed for the way today's students read, think, and learn. Explore Research: Students can explore research around the world with new Original Research Videos. Investigation questions further encourage students to analyze the material in each chapter. Demonstrates Practically: Several features throughout the book help readers connect abstract ideas to real-life situations. Improves Learning: Effective pedagogy features promote students’ learning. For examples, Quick Quiz Self-tests in each chapter allows students to test their understanding of the material. Support Instructors: Video embedded PowerPoints, MyTest, clicker questions, and an instructor’s manual provide instructors with extensive materials to supplement the text.